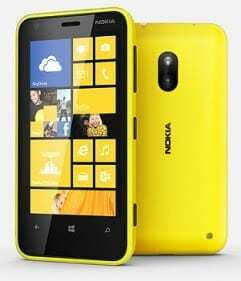 Nokia Lumia 620, a low cost mid-range Windows Phone 8 smartphone, is now available in Nigeria. Before the launch of the Nokia Lumia 520, Nokia Lumia 620 was the cheapest WP8 member of the Nokia Lumia Phones family. If you are looking for solid hardware at a decent price, Nokia Lumia 620 is a great choice. Nokia Lumia 620 runs Windows Phone 8 OS on a 1GHz dual-core processor paired with 512MB RAM. It comes with the best Office productivity software, the MS Office as well as the best location and navigation software from Nokia like Nokia Maps and Nokia City Lens. Nokia Lumia 620 comes with 8GB built-in storage and free 7GB SkyDrive Cloud Storage. It also comes with a microSD slot that can support up to 64GB. Nokia Lumia 620 features a 3.8-inch display and 5MP camera. It comes in colourful shells in lime green, orange, magenta, yellow, cyan, white and black. However, all colours may not be available. You can buy Nokia Lumia 620 online at leading online stores in Nigeria as well as reputable phone stores. If you are wondering the features of this smartphone, read our Nokia Lumia 620 article. The Price of the Nokia Lumia 620 in Nigeria ranges from N35,200 to N42,500.